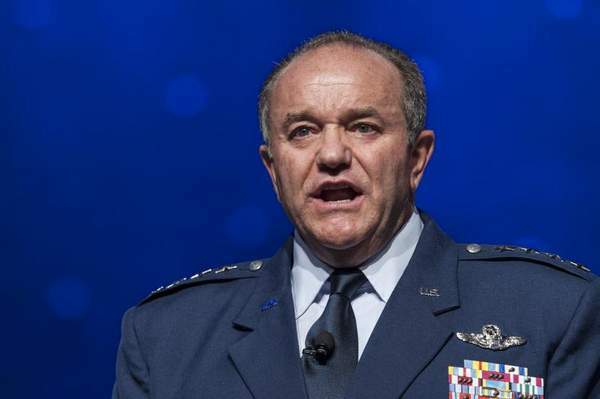 Gen. Philip Breedlove, Supreme Allied Commander, Europe and Commander of U.S. European Command, speaks Monday during the Air Force Association’s Air & Space Conference. Breedlove spoke at the Pentagon Tuesday and said leaders are reconsidering downsizing forces in Europe. (Staff photo). Pentagon leaders may not go through with downsizing U.S. military forces in Europe given the continuous problem of Russia’s behavior in the east, Gen. Philip Breedlove, commander, U.S. European Command and NATO Supreme Allied Commander, told reporters during a Pentagon news conference Sept. 16. The number of U.S. troops based in Europe has dropped from several hundred thousand to around 64,000 today, according to a Defense Department news release, with the majority of those remaining based in Germany. Under Operation Atlantic Resolve, an ongoing effort to demonstrate U.S. commitment to NATO allies and European partners, for example, dozens of exercises have taken place this year, with more on the way. Breedlove said the exercise rotations will go on as scheduled until permanent adaptations approved at the NATO summit are implemented.